Ok folks! Let’s get right to the point: the ezpz Happy Mat is a true winner in every way! As a reviewer, obviously I look for new products to investigate – and I sometimes find them in interesting ways. One of them is through television, and I don’t mean commercial advertisements. I have to admit that I’m a Shark Tank junkie and I love to promote products that have been on the show, such as the Squatty Potty – another total winner (not to mention their great “Unicorn Pooping” commercial). So, it was through Shark Tank I was introduced to www.ezpzfun.com when the program showcased the original ezpz Happy Mat, a child’s placemat that sticks to the surface of the table so a child can’t go hurling food and dish off as the meal progresses. Lindsey Laurain, the founder of ezpz, shared on the show that the company netted $1.2 million in gross sales and $140, 00 in profit in their first year. Although two “sharks” offered her deals structured around her basic goals but not the one she requested, in the end she decided not to accept because in the end the fit just wasn’t quite right for her needs. The next year her sales climbed to $2 million and the company continues to grow in sales and add new products through today. Watch ezpz on Shark Tank! 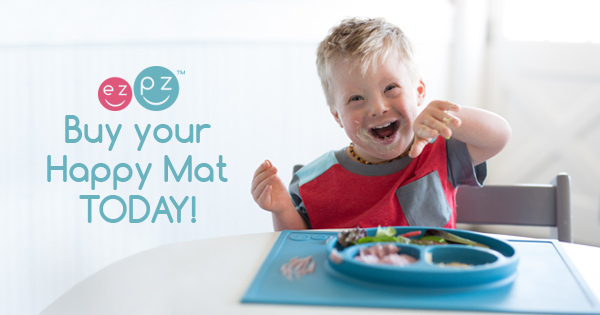 The Happy Mat, ezpz’s signature product, works through suction to keep its silicon placemat attached to the tabletop. It is made of 100 percent food-grade silicon, as are all the companies’ mats. 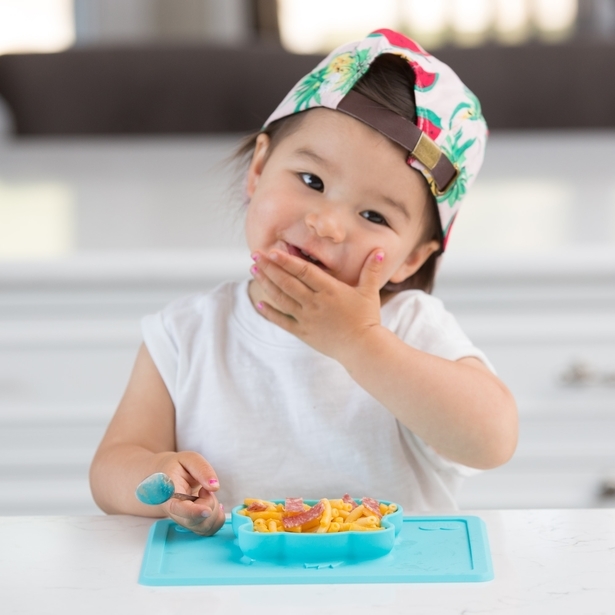 All the placemat and dish combination products: the Happy Mat, Happy Bowl, Mini Mat, Flower Place Mat, Mini Bowl – and most recently the Care Bear Collection; are microwave, dishwasher, and oven safe (up to 350°). They are BPA, BPS, PVC, phthalate, and latex free as well as hypo-allergenic. The products do not harbor bacteria. They promote self-feeding and the development of fine motor skills. Not only do they make mealtime easier for everyone, a genius idea all by itself, but they are colorful and fun! They have also become my go-to gift for baby showers and birthday gifts for all my friend’s babies, grandbabies, and toddlers. The original ezpz Happy Mat retails online for $24.99 (less for the Mini Bowls, and just a few dollars for the Micro Mats) and is available in seven colors: coral, lime, gray, blue, blush, sage , and pewter. It is an all-in-one plate and placemat that captures all the dining mess of your infant/toddler and keeps it confined to one space. It suctions directly to the table, making it nearly impossible for tiny hands to lift up and tip over. Measuring 15 inches by ten inches by one inch, it fits most standard high chairs. Three to four mats can be stacked and carried with food in them. They are easy to store because of their flat bottoms and are built to last. They don’t corrode, fade, or deteriorate. The portion sizes (in the “eyes” and “smiles” of the dish) are suited to toddlers at four ounces in the eyes and 10 ounces in the smile. These compartments encourage parents to serve a fruit, veggie, and protein plus carbohydrate for a balanced meal. Its smiley face design also encourages kids to be in a positive mealtime mood, promoting self-feeding. Reaching for fruit and veggie pieces also develops fine motor skills and eye-hand coordination. The Happy Bowl is the next evolution of the Happy Mat. It also suctions directly to the table, making it difficult to tip over and spill its contents. At its one and one half inch height, the bowl is perfect for a variety of foods, including soup, cereal, oatmeal, and pasta. This products is designed for infants/toddles from six months+ and retails at $19.99 It holds an eight ounce portion of food. You can microwave food directly in the bowl to warm it. Made of the same material as the Happy Mat, it has all the same product qualities as well and is offered in the same colors. Its base size is slightly larger than the Happy Mat at 15 inches by ten inches. The Mini Mat is another all- in-one- placemat. Like the larger ones, it suctions to the table and is ezpz’s solution for travelers. At ten and three quarter inches by seven and three quarter inches by one inch, the Mini Mat fits most high chair trays including “space saver” models. It caters to infants with two ounce portion sizes for the eyes and four once potions in the smile. It is perfect for traveling and dinners out because it is lightweight and compact. Easy to carry, it comes packaged in a reusable bag that you can stow away in your diaper bag. It retails for $19.99. I think this would be especially helpful to have for a child who is used to the Happy Mat at home, so there is mealtime continuity in a strange place to help the child eat well. In addition to these three mat/dish combinations, ezpz offers five specialty items for sale as well. One is the “bapron” – a bib/apron hybrid. They also have a combo Happy Bowl + Logan & Lenora Wet Bag. It seems like they come out with fun and new ideas pretty often from what I’ve been seeing. Another specialty item is their cookbook, “Making Mealtime Ezpz: Fun Ways to Fill the Happy Mat” is full of tips on healthy foods, dealing with picky eaters, and much more. It contains lots of recipes and fun food art to make that are ezpz for parents. It retails for $19.99. A good companion gift to pair with the cookbook is their Silly Billyz Bib, which retails for $8.99. This bandana bib is made from premium 100 percent cotton jersey that is machine washable and tumble-dry safe. It features a three position snap closure neck to assure a comfortable fit. It is great for not only mealtimes but all day drooling. The fourth specialty item is the Flower Play Mat. This mat is a fun change of pace since it can be used for more than just serving food. With the “flower” off to the side, it is designed to be used for art and fun too! Available in lemon and mint and retailing for less than $28, the Flower Play Mat is perfect for painting, bead working, necklace making, Lego sorting, and anything your imagination can devise. The petal cup divisions of the flower are sized for the pincer grip of a child, which assists with the development of fine motor skills. The container’s higher lip captures beads, water and the other materials you place in them. The mat’s size (16.5 by 12.25 by one and one quarter inch) can hold a standard (eight and one half by 11 inch) sheet of paper. The Micro Mat is the other specialty offering. Priced at $3.99 and made in blue or pink, this tiny mat (only three inches by two inches) is smaller than a crayon. And it’s the right size to serve your little one’s Legos and dolls. It is also just the right size for introducing a morsel of a new food. You can have it placed beside the regular Happy Mat during a meal! ezpz currently earns 4.5 stars out of well over 1500+ reviews on Amazon. 71% of these are 5 star ratings, with 12% at 4 stars. See the product page I’m referring to at Amazon HERE (basic ezpz Happy Mat). Their website, www.ezpzfun.com, offers many recipes posted from their customers with pictures and stories to enjoy. They also have their Mealtime Made ezpz Blog with great posts such as: “The Happy Mat and Child Development”, “How to Introduce Blueberries to Your Toddlers”, and “Language Activities on the Happy Mat”. If you have infants and toddlers in your life or know someone who does, I highly recommend ezpz’s products! And I think this would be an awesome baby shower (or other gift-giving occasion) gift too!